Last year I had the very good fortune to be asked by HBO to preview their mini series John Adams, it was an exceptionally well made series and one that I enjoyed enormously. There were several concepts that were looked at in depth, and maybe the most important ones were sacrifice and honesty.Â Being a politician often meant huge personal sacrifices, spending months, or even years away from friends and family, it was not done for personal gain but from a love of a young country and its principles.Â Oh how things have changed since the days of John Adams. Arthur Woodrow has created quite the opus with Election Hangover. My head still hurts from the 22 months of pointless bickering and finger pointing that we euphemistically refer to as an Election. I like books that get straight to the meat and potatoes of whatever subject they happen to be about, Arthur wastes not one word and gets straight to the point. Election Hangover is actually born from an earlier work that I had the good fortune to read. What is wrong with our political system? Well basically everything. I think the central theme that Arthur makes is that of the career politician, if you analyze the words and deeds of the founding fathers it was not their intent was to make politics a career, it was more of a way of giving back to society. Oh how things have changed. Politics has become an industry, and we have career politicians. Even worse, we pay these ‘servants’ of the people handsomely and allow them to run amok with no control. Some of the data that Arthur uses is very sobering. As the classic saying goes ‘A billion here, a billion there, pretty soon you are talking real money.’ Over a billion dollars of ‘stuff’ has gone missing in Iraq alone. Sure, as any small business owner knows, things to go missing, things get broken, or even stolen. But a billion dollars of missing items gives you pause for thought. But what can we the people do about it? Simple, boot the damn career politicians out! I have to admit that for the most part I am in total agreement with Arthur Woodrow. He advocates changing the system to limit terms to exactly one. With a single term limit a great deal of the temptations would be removed from the system. It is estimated that there are over 34,000 registered lobbyists, that is an eye popping 72 for each of our elected representatives. And what do these fine folks do? Well for the average person absolutely nothing, for the the special interest groups they are a god send, and for the politico’s they are a food ticket. Free travel, free meals, free almost everything you can name. In reading this review you might get the impression that Arthur Woodrow is partisan, he is not, his group supports no party, in fact it actively states opposition to the current political arrangement. Gone are the days when there was delineation between the parties, today it is all just BIG government, fat, bloated, and over fed. Arthur picks out a few special interest groups, the NRA being one, now I have to admit that I for one can not think of any sane reason why anyone would need a semi-automatic weapon, but they have been successful in quashing every attempt to ban them. Other miscreants that are spotlighted are trial lawyers, particularly the ones involved in class action suits. The world of tort has reached the silly stage, the only winner is the lawyer, often the people being represented walk away with a $20 gift card while the lawyers rake in millions to finance their BMW’s and Armani suits. The other special interest group that causes me sleepless nights are the folks that we entrust our children to on a daily basis. The teachers have a huge lobbying effort. No pay increases for productivity for these guys and gals. They happily accept regular pay increases yet do little to improve what I perceive as a horrible decline in educational standards in the past 4 decades. No Child Left behind? More like, no child advancing. The author isnâ€™t interested in financial gain, so heâ€™s offering the e-book free; the paperback and Kindle copies are priced under ten dollars to cover production costs. His intent is to reunite the country by inspiring readers to vote against the incumbents. 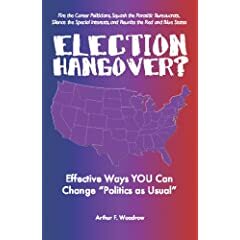 2 users commented in " Book Review: Election Hangover by Arthur Woodrow "